An Oahu jet skiing adventure is the perfect way for any thrillseeker, even the inexperienced, to spend time in Honolulu. Honolulu jet ski riding includes instruction and safety tips, so beginners and experienced jet skiers alike can enjoy the fun. 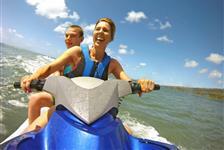 Book your Oahu jet ski excursion below!